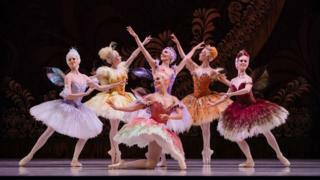 A hungry rat has been blamed for a power failure during a ballet in Australia. Dancers and audience members were plunged into darkness during the second half of a Sleeping Beauty performance by the Australian Ballet. About 2,000 patrons had to be evacuated by torchlight from the theatre in Adelaide after realising the outage was not an artistic effect. State energy authorities later confirmed rodent damage as the cause. "[Crews] found a rat that crawled inside one of our 11,000-volt pieces of equipment and had blown a fuse," a spokeswoman from South Australia Power Network said. The power outage affected the city's entire riverside arts precinct, and stopped another dance performance in the Adelaide Festival Centre. Dancers initially carried on with the performance before they were stopped by management. They received a standing ovation from an audience lit by the glow of mobile phones, the Adelaide Advertiser newspaper reported. The theatre's programming director Liz Hawkins told the Australian Broadcasting Corp the incident was unprecedented but patrons had responded with good grace. The ballet won't be rescheduled, but the audience will be given either a refund or some other form of compensation. The rat, it is presumed, did not make it.